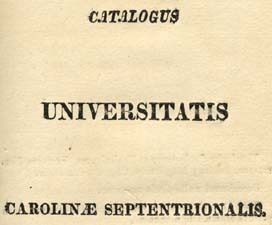 University of North Carolina (1793-1962) Catalogus Universitatis Carolinæ Septentrionalis. Raleigh: E. Typis J. Gales, 1817. University of North Carolina (1793-1962) -- Alumni and alumnae. University of North Carolina (1793-1962) -- Registers.